The more interesting awards discussion surrounding this book is actually about audience. Is Fleming more likely to be in the running for a Newbery or a Printz? And yes, that last sentence assumes that The Family Romanov is a serious contender for one or both, because really, if it isn’t, I’m going to have seriously re-think everything I know about the world. (Full disclosure: I have yet to read Jonathan Hunt’s review over at Heavy Medal; I intentionally avoid reading other reviews before I write my own, but I will read it before we dig into this question in the comments.) Although I can’t speak to Newbery criteria, I strongly believe that this book is best for fourteen-year-olds and up; mainly because of the advanced development of themes, the dense information included, and the nuanced character writing in a narrative package that’s utterly gripping and dramatically complex. I’m sure that some younger readers will read and adore this book, but it reads like it was designed to help teens start to question authority, and that’s very teen. The Family Romanov has arrived at an incredibly relevant moment given the growing wealth inequality in the U.S. and abroad, and the current turmoil in Russia. It’s a timely story that helped me understand the Russian Revolution far better than I ever had before** and also forced me to reflect on our world today, making me wonder what changes our society could—or should—make to avoid similar mistakes. Throughout a thrilling and taut narrative Fleming raises uncomfortable truths about power, hubris, ignorance, and greed. Complex and messy concepts for teens of course, but what clarifies these issues is that Fleming never forgets that real people are what makes the themes resonate so deeply, and so just as much care goes into developing character. She does an especially good job with Alexandra, describing a devout convert to Christian Orthodoxy, showing how Rasputin took advantage of her faith, and ultimately manipulated her and Nicholas in order to become (then remain) powerful and influential. Fleming’s structure for the tale of the Romanov downfall provides the reader with the necessary context to see the whole picture without overwhelming the dramatic narrative with extraneous material. The major way she achieves this is through the use of primary source writing throughout the book in sections called, “Beyond the Palace Gates.” She gives us the voices of peasants and workers who suffered through hunger, disease, and death while the Romanovs were more worried about birthing a son and politicians cared more about themselves than the people they were supposed to represent. Fleming uses these excerpts from memoirs and diaries to either reflect the previous section or set up the next. They’re stark comparisons of the Romanovs and their subjects that make the reader omniscient and therefore heighten the dramatic tension, as we are able to witness, understand, and then predict events. Despite stopping the narrative thrust by introducing new people and stories, these sections keep the plot moving because it’s easier to digest this amount of information in smaller pieces. Fleming’s focus on character is a hook, and tight plotting with just the right amount of factual context sustains interest. It’s rich and layered but ridiculously engaging and such a page-turner that I had no problem reading it for hours on the beach a few months ago. Nowhere is this more evident than in Chapter 17, which describes the days leading up to the murder of the Romanovs. With each passing section, titled simply with a date, one feels the impending doom. It is simply a tour de force. Fleming maintains high tension even though we already know she is leading us to the family’s death. She uses incredible descriptive writing; carefully crafted sentence-level construction controls the mood, and it’s tense but also intensely sad. We’ve seen this family grow up over the course of the book and Fleming creates deep sympathy for them without absolving Nicholas and Alexandra of their ignorance; it’s very clear that they’ve had a hand in the collapse of Russia as well as their own demise but their stoicism in the face of execution is undeniably moving. There are no easy answers or morals at the end of this book, leaving readers with a lot to think about; isn’t that what great literature should do? There’s so much to discuss and analyze, and I’ve barely scratched the surface. I sincerely hope the Real Committee feels the same in January. How about you? *When I say “everyone,” I really mean, the librarians and book people I follow on Twitter and the real-life librarians (all New Yorkers) I know and talk to. **I guess the caveat here though is that history was never my passion when I was a teen. I agree Joy. This is YA NF at its best. Even though readers know the outcome, the pacing kept me enthralled. Excellent interweaving of narrative with personal accounts and fascinating details makes the narrative stand out, I was surprised at the multidimensional presentation of individuals. For example: While the Czar was weak and hopelessly out of touch in governing the country, his time in exile with the family, cheerfully creating the ice mountain and other diversions for his children offers readers an illuminating glimpse into his character. The concluding chapters on the burial & application for sainthood bring the book to a satisfying conclusion while inviting further discussion/exploration. A rich resource for discussion & further exploration. Yesterday, over on Twitter, Maureen (@elvenjaneite/http://bysinginglight.wordpress.com) raised some really interesting points about Family Romanov. These were personal and not refined for commentary here, but she has okayed me pasting the text into a comment, which I asked to do because I think she raised two issues worth discussing. The first comes from a place of personal knowledge — and I have seen books fall on committees and awards because someone knew enough to know when something was wrong or biased, and also seen books succeed only to find out later that if anyone had had the right body of knowledge, the book might not have succeeded. So that’s interesting, and may or may not come up for the RealCommittee, depending on the knowledge base and depending whether it’s an objective issue or not — there are books about reform Judaism that may not be WRONG, per se, but that don’t match MY experience and that therefore I find flawed — but I have to put that bias aside if it turns out it’s just me. The second issue raised is more about the way in which an actual person of history is depicted, and will vary, I imagine, for each reader. And since no one else I know has raised any objections to this book or it’s 6-star crown, I wanted these comments in the conversation. 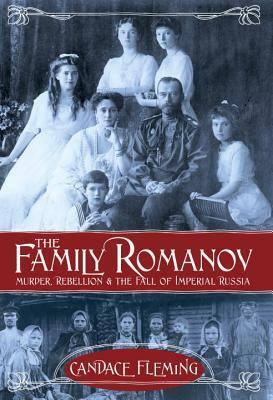 Tweet 1: DNFing The Family Romanov because its portrayal of Orthodoxy is severely upsetting me. Granted I am sensitive on this subject, but still. Tweet 2: What I read was also falling into the “bitter, hysterical Alexandra” portrayal, which I am not super okay with either. Tweet 2a: It’s by far the prevailing Western picture, and I find it extremely misogynistic for one thing! Tweet 2b: Plus rooted in various anti-German propaganda during WWI, and with the Western lack of understanding of Rasputin. Thanks for sharing these, Karyn! Maureen, I think you raise a challenging perspective. I’ve been there before with books I can’t finish (or stomach) but because you clearly have strong background info, I would love to hear what you think after you read the whole thing. I’m not familiar with the prevailing opinions on this part of history, and I’m certainly interested in knowing if the research on which this book is founded is flawed. Because Fleming uses a lot of primary sources, I was less inclined to suspect deep flaws in the research, but I’m definitely not an expert. Speaking to the point about Alexandra; I read Nicholas and Alexandra as incredibly complex individuals. They both held a very narrow and harmful worldview, because both were born into the monarchy but very unprepared to lead. Alexandra is presented as someone given to religious zealotry prior to her conversion to Russian Orthodoxy (beginning after the death of her mother). Fleming’s presents her as a woman who needed to believe in something higher than herself, and Rasputin happened to be the person there to take advantage of that need. However, I also feel that she had incredibly strong opinions of her own, while at the same time seemed deeply concerned with her children. Again, I always got this sense from Fleming that there was a complicated inner life there. Now chiming in as me, in response to Maureen’s points. I am really intrigued by her comment about the portrayal of Alexandra — with the caveat that I haven’t read The Family Romanov yet. When there is dispute about a figure from history, and the most widely known image is perhaps biased, what responsibility does the biographer have? If it’s the best known depiction, is it a failure on Fleming’s part to follow suit (and follow established research)? Does the author for a youth audience have an extra obligation given the recognition that this is likely the first time the audience will have come across most of the content? I haven’t read The Family Romanov, but I have read several adult non-fiction works about the Romanovs, as well as some of the recent crop of start-of-World-War-I books. I’m not quite sure how to take those tweets. If a writer is relying on primary and secondary sources, they will likely come up with the “prevailing Western view.” Indeed, you can hardly fault them for doing so. I would expect any writer to provide nuances to a character, but if they were to charge ahead, ignoring evidence to write an “everything you know is wrong” type book, it would hardly be suitable to use in classrooms or for younger readers. I read a lot of history, mainly adult, and the best writers of it shape a story without selecting it and are willing to admit their subjects are complex people. If the Family Romanov does this, it should be fine. I’m in the middle of reading, but immediately noticed an error that bothered me. I looked over the family tree quite a bit before starting to read, so I noticed that Nicholas II was 17 when his grandfather died, according to it. Then on the first page, it says he was 13. It appears that the family tree is incorrect vs. the text. I haven’t finished it yet, but I understand there’s at least one other error in the text. I know some committees will overlook these things…but will this year’s Newbery and Printz??? I hope they noticed! @Jennifer, I’ll have to check that out when I’m back at work and can look at the final copy. Thanks for pointing it out. I think you’re right; each committee will have their own threshold for tolerable textual errors/typos. So it seems that the error is in the family tree. Nicholas II was born in 1868 (http://www.biography.com/people/nicholas-ii-21032713), although the family tree says 1864. The rest of the math adds up (so to speak) in the text, so I think the error is just a typo. What’s the other error you mentioned? Clearly a typo and not something that should be a factor in determining the quality of the book. At least I don’t think so. Would like to know of the other error as well. I’m with you, Monica; while consistently sloppy copy does knock a book down for me, a single typo in the frontmatter doesn’t feel significant enough to be a make it or break it. I have the inside scoop from Random House: the family tree was created by an outside source, but Fleming and her editors fact-checked it and found it correct, then it went to press and inexplicably came back incorrect. The errors were immediately changed for the second and subsequent printings of the book (which are currently available). The direction error should have been caught by the copyeditor, but will also be changed in subsequent editions of the book. Having taught map skills to elementary and middle school children, I know that this can be tricky. Siberia is east of Moscow, but you travel west to get there. To me, this is akin to a typo. The kind of thing you can answer correctly on a test when it has your full attention, but which you inadvertently mess up when you’ve got five other things that you’re focusing on in the narrative. I say this by way of explanation, rather than excuse. The committee has to judge the book in hand, rather than the one that the author intended to write or the one that the publisher intended to publish. Yet this raises an interesting question: If a book has multiple printings in the year of its publication, and there are minor changes made from the first to the second, does one printing take priority? Is it the one the publisher submits? Hmmm.